A Maiden Stakes over 5f 20y on Standard going. Eleven runners take part: five colts, six fillies. Ten have race experience bar the lone debutante. John Butler doesn't have many two-year-olds but Desert Mark looks an able horse. This bay colt is a son of Approve and decent purchase [November] at £17,000. This April foal was previously trained by Richard Hannon in the ownership of Sheikh Juma Dalmook Al Maktoum. Desert Mark ran well on debut and then just failed at Brighton losing by a short head. With over a month on the sideline, this colt is fancied in the betting and on form has some claims. There is always a slight concern when a horse changes stables and perhaps more so with a trainer who has a small string of two-year-olds. I hope this juvenile goes well for his new connections. The betting suggests this is an open race with a good few featuring in prominently in the market. China Horse Club has plenty of money to buy quality horses. Enhancement cost 220,000E when purchased at the yearling sales.Trained by Richard Hannon, he wasn't at all fancied on debut when returning a 33-1 shot. Although finishing tenth he wasn't beaten a great number of lengths. This son of Invincible Spirit was supported by punters next time out when priced 16-1 [from 25-1]. Ridden by Sean Levey, he wasn't disgraced in fifth, beaten less than five lengths. The most interesting aspect of his colt, for many readers, will be noting he has dropped from seven furlongs to five. It makes me wonder what has been said in dispatches for this turnabout. Enhancement is fancied in the betting. Even if he is a sprinter, seven furlongs might have been imprinted on this juvenile's mind and this minimum trip could come as a rude awakening. Will he have the pace to sit handy? Time will tell. However, I would be concerned he will have the mindset of a seven-furlong campaigner. Clearly. connections will have been considering this point and prepped this two-year-old for sprinting. Intriguing but a question mark in my mind. Another horse following a similar stamina-to-sprint format is Ed McMahon's Lesanti. This bay colt has shown good pace and may well appreciate this drop in distance. However, it is one thing to show speed over seven furlongs and another over five. McMahon is a class trainer, and he isn't beyond a surprise. A wide draw is a stumbling block. I would have to take a watching brief but may be a horse with some hope. McMahon also fields The Daley Express who hasn't been seen since the end of May. This son of Elzaam is well bred out of the talented mare Seraphina, which readers may remember winning the Brocklesby Stakes in 1999. She was a tremendous horse racing seventeen times in her career. Strangely, she only ever won on debut but had her days when going close at the highest level. 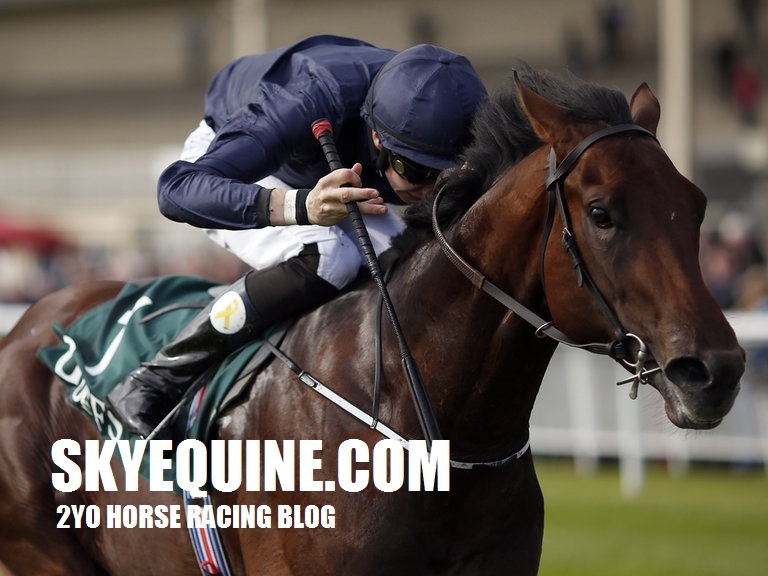 These included runner-up in the Lowther Stakes Group 2 & fourth in the Cheveley Park Stakes Group 1. The Daley Express ran well on debut at 20-1 when competing over 5f at Leicester. He was a big price simply because McMahan doesn't have the support he so dearly deserves. I'd definitely give this juvenile a fighting chance. David Baron fields the only debutant. Rozy Boys is owned by M. Rozenbroek and a £33,000 yearling purchase. This bay gelding is a son of Kyllachy out of a winning mare who was trained by Hughie Morrison. Barron is an interesting trainer who can ready a juvenile to win on their racecourse bow. If priced 10/1 & less SP has claims although if weak in the market I would take a watching brief. The betting should tell the story. Chris Wall is a fantastic trainer - astute. Atlantic Belle is a daughter of Zebedee and fine 11,000G yearling purchase. She ran well last time out before struggling to finish and may relish this drop to five furlongs. One for the shortlist. Defining Moment made her debut in a fair race at Leicester. It is a course Rae Guest often sends his better juveniles which may give further hope today. This daughter of Camacho is owned and homebred for Derek J Wills. May hold claims, especially if well backed. Hamidan's Girl has shown the ability for Keith Dalgleish losing by relatively small margins in all four starts to date. This daughter of Bahamian Bounty is a keen type and well drawn in stall two. It would seem likely she will lead. She has a level of ability but may be susceptible to a horse with a touch of class. Street Jazz is another horse who has been kept busy in this formative season with six runs to date. James Given's filly has an official rating of just 68. The Cool Silk Partnership [owners] have plenty of good stock but for breeding purposes would love to see this daughter of Acclamation prevail. Another juvenile who is likely to hit the front but may well struggle to hold one or two of these at the line. Conclusion: As you can tell from this expansive review - this looks a tricky affair. Rozy Boys may hold fair each-way claims if priced 10/1 & less SP. It is difficult for a debutante to take on experienced horses because any weakness from the stall will make this very hard work. However, if fancied in the market worthy of note. If weak, best watched. The Daley Express must be sent here with some confidence. Ed McMahon is a talented trainer and this colt is well bred. If taking after mother or father, he will be a tough nut. One of the leading chances especially is priced 7/1 & less SP. Atlantic Belle has fair each-way claims. A fascinating but tricky race. If fancied in the betting, The Daley Express has a fighting chance although has to defy a lengthy spell on the sidelines.